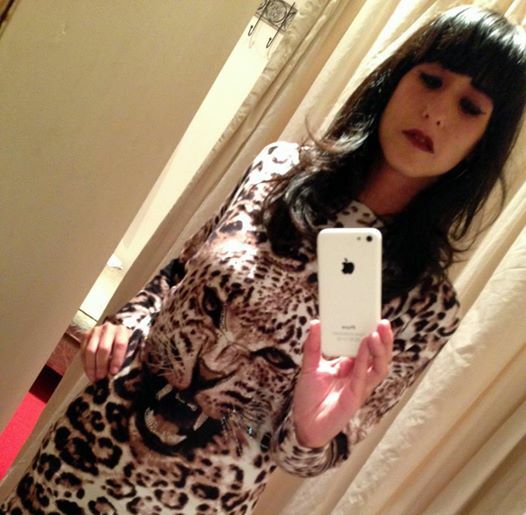 What’s in fashion autumn 2013? After a short stint away from the boutique I am absolutely delighted to say that I am now back. And just imagine my excitement on my return to see the boutique positively full to the brim with brand new sumptuous gowns with sequins galore! As much as I will always adore full sequinned gowns, what has really held my interest is the batch of new printed party tops and cocktail dresses. This season’s catwalks have been overrun by geometric patterns and prints, and, on viewing the new collections from top designers such as Givenchy and Cavalli I can confirm that patterns and printed outfits are IN this season! I do concede that it may not be wholly appropriate to go out to a semi-casual evening dinner donned in full on ball gown (as nice as the whole concept may be! ), so a glamorous top with a nice skirt or pair of trousers means that you can still stay classy and chic in your more casual attire. I adore this gorgeous long sleeved Versace inspired shirt (pictured left) made of satin and chiffon with tails. 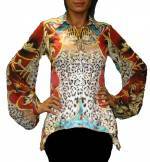 This shirt utilises a modern mirror print technique perfectly and uses a vibrant colour spectrum of burnt oranges, ruby reds, shimmering golds, turquoises and my favourite – animal print. The style of this top is so versatile and can be dressed up with a pencil skirt or pair of trousers, or you can dress it down with leggings or your favourite jeans. With it’s fantastic feature lace up back you can guarantee that you will have a perfect fit, even if (like me!) you are different sizes on different parts of your body! Pictured right is a truly unique, whimsical, mystical printed top with unicorn and gorgeous little bling bling zebras. This carefree, easy to wear modern top has a little bar across the back of the neck to ensure that you get none of that annoying ‘slippage’ from your shoulders. This top looks fabulous when teamed with a pair of skinny jeans or black trousers. Printed dresses are also really in vogue this season, this particular mini dress to the left has uber-modern, ultra-cool features such as a mesh back and darling little studs around the shoulders. This dress has all the opulence of fashionable prints and colours at the moment plus a bit of biker chic with the leatherette sleeve features, giving it a fresh, unique look and makes it the perfect dress to take you from day to evening. This stunning Cavalli style knee length sleeved dress pictured right is a fabulous way of keeping in line with the current print fashion trend and it’s sleeves are great if you are an arm hater! Being more subtle in the colour department with it’s earthy colour tones of golds and greens it reminds me somewhat of a Raphaelite painting, and, just like a Raphaelite painting, it is a true masterpiece. This dress gives you a great figure hugging fit with it’s super stretchy fabric and the low open back gives a touch of sexiness whilst still remaining classy. With patterned outfits I usually suggest simple jewellery, however, I am prepared to do a complete U-turn with this fashion trend and recommend that you wear grand, statement pieces. The opulence of this look screams out for some sumptious and regal jewellery. Think chunky necklaces and bangles in golds and burnished coppers along with matching oversized earrings. We are offering these distinctive, creative dresses and tops at super value prices to buy, or if you are on a budget, don’t forget that you can also hire them for a fraction of the cost!